A team of 13 fifth graders from Sunset Ridge Intermediate School placed among the top five competing schools in every scheduled event at the Eleventh Annual Elementary Science Olympiad Invitational Tournament at Clark College on November 17, 2018. The students competed against students from 15 other schools from throughout Clark County. The event, sponsored by Clark College and Southwest Washington Regional Science Olympiad, encourages science exploration for elementary school students in Grades 3-5 via competition structured in a fun tournament framework. Teams competed in three building challenges (Gummy Bear Long Jump, Hold the Cold, and Toppling Towers) and two knowledge challenges (Physiology Fun: Sense-ational Senses and Weather or Not). 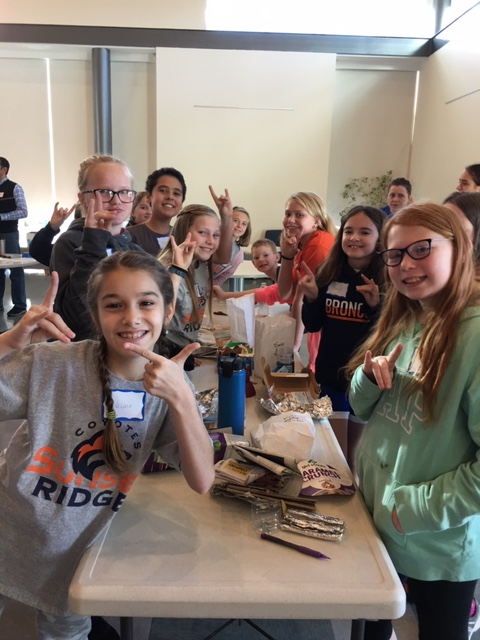 The Sunset Ridge Team placed second in the Toppling Towers building challenge and captured sixth and eighth place in the other two building challenges. In the knowledge challenges, the team placed second in Physiology Fun: Sense-ational Senses and fourth in Weather or Not. Linda Wear, Sunset Ridge Intermediate School teacher, tells her students that science is collaborative, not competitive. “Although you cannot “win” at the Science Olympiad, you can do well in the individual events,” she said. Ribbons were awarded to the teams who placed among the top five schools in each event, and Sunset Ridge was recognized for having the second highest small team scores in three of the five events.